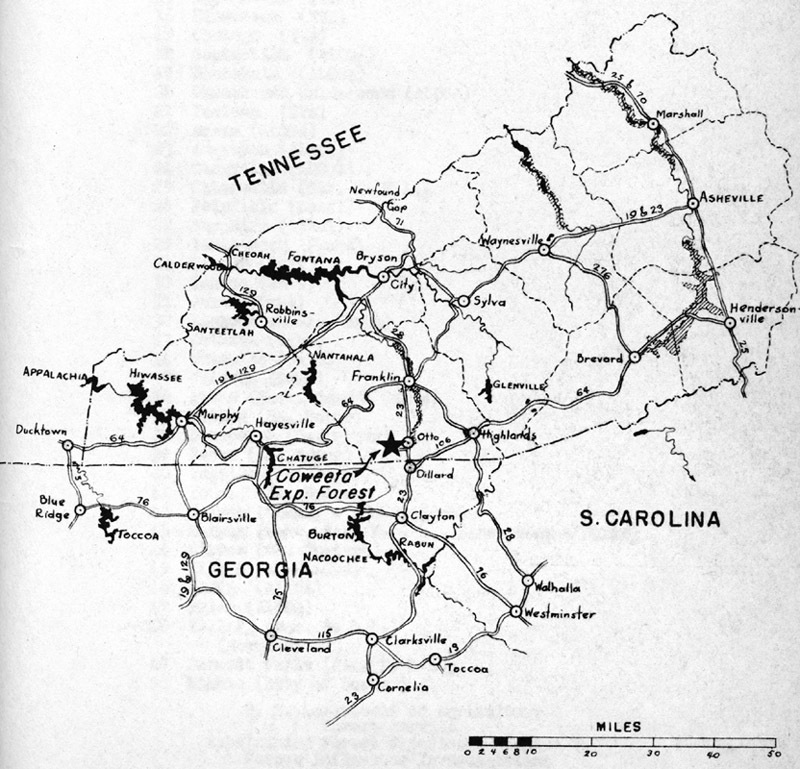 In 1934, the Coweeta Experimental Forest was officially established on nearly 4,000 acres of Nantahala National Forest land just north of the North Carolina-Georgia border. 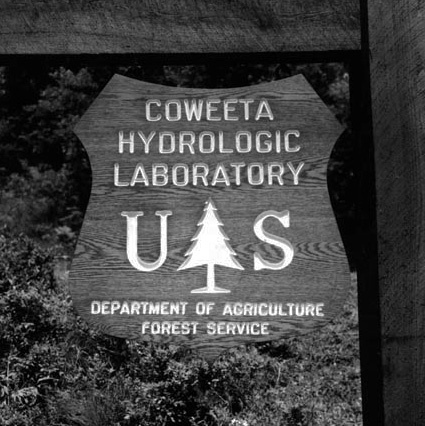 Renamed the Coweeta Hydrologic Laboratory in 1948, the site would prove to be the source of some of the most influential research on forested watersheds done in the world. Dr. Charles R. Hursh was instrumental in the creation and development of Coweeta. Hursh, a researcher at the Appalachian Forest Experiment Station (now the Southern Research Station) in Asheville, NC, was involved in streamflow and erosion work during the 1920s. During this time, Hursh identified the Coweeta Basin (in the Appalachian Mountains just south of Franklin, NC) as an ideal spot to locate a permanent research station to study the impacts of forest management practices on soil and water. Hursh's lobbying led to the signing of an order in June 1933 establishing the Coweeta Experimental Forest. The order was then officially approved by Chief Ferdinand Silcox on March 28, 1934. Civilian Conservation Corps workers from CCC Camp NC-23 in Franklin, NC, built the roads, buildings, testing stations, and other permanent installations on the site during the 1930s. Hursh, operating with limited resources and staffing, was still able to turn the site into an extensive hydrological laboratory and research station. Early studies at the site examined the effects of logging, farming, and woodland grazing on forest watersheds. Data gathered at the site was also used for important research in areas such as riparian vegetation and water supply; the properties of groundwater movement through soil; relationships between the atmosphere, environment, and forest watersheds; and the use of road banks for erosion control. 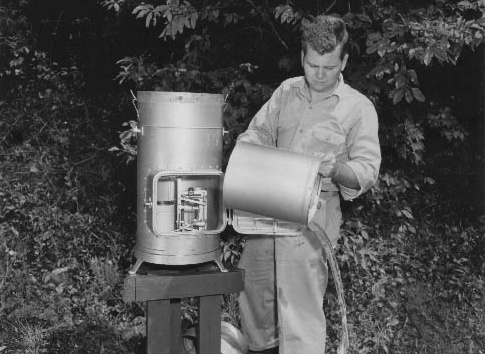 Tom Nelson emptying rain gauges at Coweeta Hydrologic Lab, 1952. The arrival of researcher Wayne T. Swank at the laboratory in the 1960s ensured the continuation of Coweeta’s influential work. Swank spent more than 30 years at Coweeta, serving as project leader from 1984 to 1999, and helped to expand the successful research operations at the site. Cooperative work with the University of Georgia’s Institute of Ecology began in 1968, and produced an ongoing valuable partnership. Coweeta also became a National Science Foundation Long-Term Ecological Research site in 1980. More recent years have seen the work shift to new areas of study such as water quality research, acid rain, invasive pests, and prescribed fire. Coweeta continues operations today as one of the oldest continuous environmental research studies in the world. "Coweeta Hydrologic Lab Celebrates 75 Years," from Peeling Back the Bark, 2009.